Just in time for the inauguration of Donald Trump as the president of the United States, you can buy a naked Trump bobblehead. 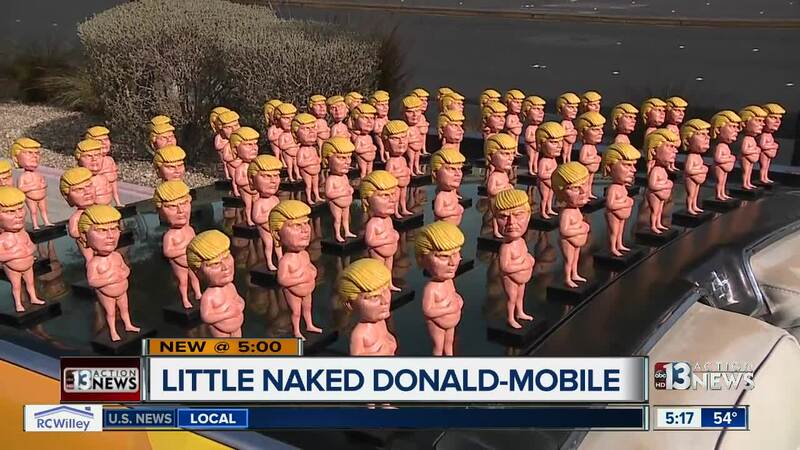 A Las Vegas artist by the name of Joshua "Ginger" Monroe created the Naked Trump statues a few months ago for the American anarchist art collective known as INDECLINE. The statues were based on the story "The Emperor's New Clothes." Life-size versions of the statue popped up in five major cities and in downtown Las Vegas in September 2016. The statues created quite a stir and made headlines around the world. Some of the statues can be found in art galleries or were purchased at auction. Others were stolen or vandalized, including the one in Las Vegas. The nine-inch bobbleheads, which were made in China, are currently on sale on Amazon and eBay for $30 to $35, including shipping. You can also purchase a 3-inch version for $5. The bobbleheads were the idea of venture capitalist Richard Schwartz. He says that he approached the artist with the idea and the artist gave him the thumbs up. In an effort to promote sales of the novelty item, Schwartz covered a 1961 Lincoln Continental with the bobbleheads. Schwartz told 13 Action News that he has received mostly positive responses, from people who like and dislike Trump. You can also purchase the bobbleheads at littlenakeddonald.com .